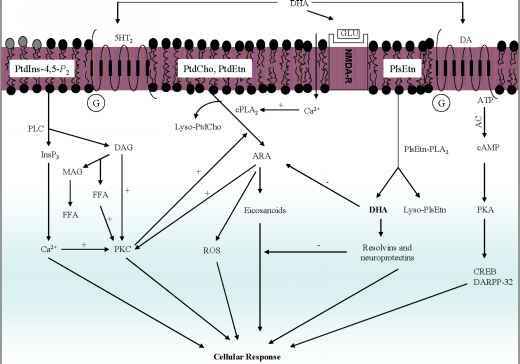 In neural membranes DHA mainly incorporates in ethanolamine plasmalogen (PlsEtn) and phosphatidylserine (PtdSer), whereas majority of ARA incorporates into phosphatidylcholine (PtdCho). From PlsEtn and PtdSer, DHA is released by the action of plasmalogen-selective PLA2 and PtdSer hydrolyzing PLA2, respectively [12-15]. The released DHA is metabolized into resolvins and neuroprotectins by 15-lipoxygenase [16-18]. These mediators are collectively known as docosanoids. They have anti-inflammatory and antiapoptotic properties and are involved in neuroprotection. In addition, docosanoids have antithrombotic, antiarrhythmic, hypolipidemic, and vasodilatory effects [4,16-18]. In contrast, ARA is released from neural membrane PtdCho by cPLA2 and metabolized to prostaglandins, leukotrienes and thromboxanes. These metabolites are collectively known as eicosanoids. These metabolites have prothrombotic, proaggregatory, and proinflammatory properties. The levels of eicosanoids and docosanoids in neural and non-neural tissues are partly regulated by diet (see below). stimulates PLA2 and inhibits PLD [19-20]. Similarly, generation of ARA and eicosanoids activate PLD . Figure 2. 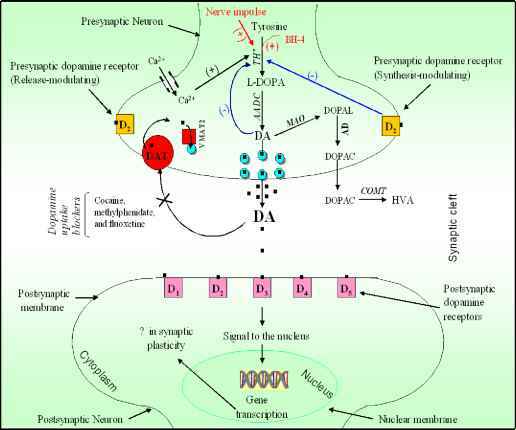 Degradation of neural membrane glycerophospholipid by receptor mediated phospholipases A2 and C. Serotonin receptors (5HT2) are linked to the degradation of PtdIns-4,5-P2, dopamine (DA) receptors are linked to PLA2 through G protein, dopamine receptors are also linked to Adenylyl cyclase and glutamate (GLU) receptors are linked to PLA2 through G protein independent mechanisms. Phosphatidylinositol-4,5-bisphosphate (PtdIns-4,5-P2); inositol 1,4,5-trisphosphate (Ins^3); phosphatidylcholine (PtdCho); phosphatidylethanolamine (PtdEtn); ethanolamine plasmalogen (PlsEtn); lyso-phosphatidylcholine (lyso-PtdCho); lyso-plasmalogen (lyso-PlsEtn); phospholipase C (PLC); cytosolic phospholipase A2 (cPLA2); plasmalogen-selective phospholipase A2 (PlsEtn-PLA2); Adenylyl cyclase (AC); protein kinase A (PKA); protein kinase C (PKC); arachidonic acid (ARA); diacylglycerol (DAG); monoacylglycerol (MAG); docosahexaenoic acid (DHA); reactive oxygen species (ROS); free fatty acid (FFA); cAMP response element binding protein (CREB); and cAMPregulated phosphoprotein of 32,000 kDa (DARPP-32).